Home » Crypto & Blockchain » Stellar Lumens Bullish Going Into 2019? The Chart Suggests Significant Upside Ahead. 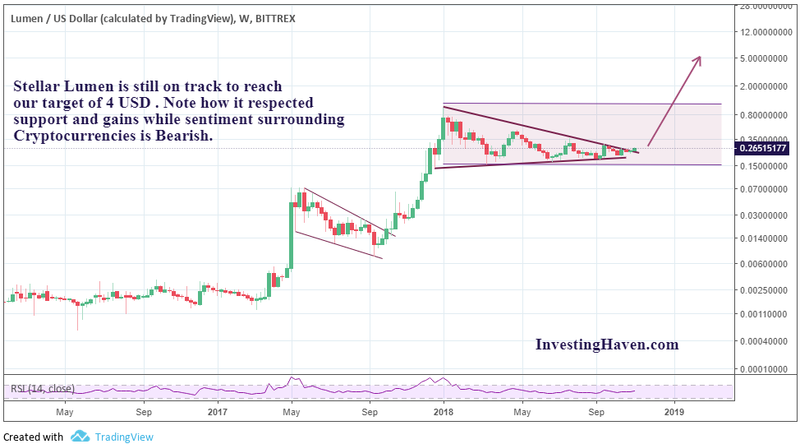 Is Stellar Lumens (XLM) bullish going into 2019? Is it still on track to reach our Stellar Lumens price forecast of 4 USD ? Questions like these are frequently asked by our readers be it for Stellar or the other selections of InvestingHaven’s top 10 cryptocurrencies and blockchain stocks. Note that we published, on December 30th 2018, a new and revised Stellar Lumens Price Forecast 2019. As the cryptocurrency market is bleeding in 2018, or may better ‘has been bleeding until recently in 2018’, we see opportunities to get the select few gems at discounted prices. Stellar Lumens is one of those select few candidates that we believe will outperform when cryptocurrencies recover. Stellar Lumens may be very bullish going into 2019. When we launched the InvestingHaven Blockchain and Crypto investing service, our team was driven by a strong desire to share the tremendous opportunity we saw in the cryptocurrency market as well as blockchain stocks. We didn’t want them to miss this opportunity to get involved but most importantly, we wanted to spare them the pains of investing in the 99% that will not survive as per the Tsaklanos 1/99 investing principle. 0.17 has been acting as an important price level. If that support is lost, expect XLMUSD to trade as low as 0.07. That scenario is less likely but risk management is an important part of any successful investing strategy. Ar the fundamentals of Stellar Lumens bullish going into 2019? The answer is yes, and it’s a great confirmation between chart and fundamentals. From a fundamental perspective, IBM has officially brought its Blockchain World Wire out of Beta, which is an important step forward in terms of adoption for Stellar. Surprisingly, no one is talking about this. Stellar’s collaboration with the leading Blockchain Wallet is another example of an initiative that could trigger massive adoption rates for Stellar, not only for Stellar’s alliance with another important player in the Crypto field but also because of the massive XLM giveaway the wallet provider is airdropping: $125,000,000 total giveaway where each verified Blockchain wallet will receive $25 worth of XLM, that’s 5 Million users that might start investing or using XLM. Lastly, Stellar’s price and adoption could also benefit in the future from the ability to issue tokens (ICOs) on Stellar. That could definitely be another positive factor for the Cryptocurrency. From the chart review as well as the usability and edge Stellar has, we believe the potential to outperform is absolutely there for Stellar. It may not necessarily be the first one to breakout but it will very likely outperform.